Ganesha Chaturthi, September 13, 2018 (IST) marks the birthday of Lord Ganesha. It is one of the most important power times in the year to welcome Ganesha, the Lord of fortune and wisdom, into your life and receive his blessings for the fulfillment of your desires and to enjoy peace and prosperity. According to scriptures, the birth of Ganesha is described as Goddess Parvati making a child figure out of turmeric powder, breathing life into him, and naming him as Ganesha. 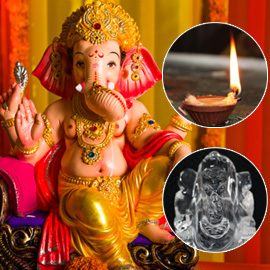 AstroVed is bringing you a comprehensive package of powerful Fire Prayers and Poojas to venerate Lord Ganesha on his birthday which includes 7 powerful Archanas (Poojas), 4 grand Homas, 2 karma busting Poojas and 1 royalty consciousness Pooja that give you the following benefits according to scriptures. Dr. Pillai says that there is a technology behind this celebration, in the form of a ritual making of the statue of Ganesha with mud. 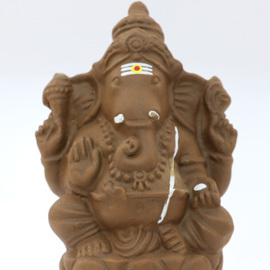 A mud Ganesha is being made, and then all of the karma is transferred to this mud Ganesha, and then after that the mud Ganesha is immersed in the ocean or in a river. As the mud image of Ganesha dissolves, it takes all of the karma that you have deposited on this image. If complimentary product is included, it will be shipped once the ritual has been performed on your behalf. Dr. Pillai says that Coconut smashing is a spiritual technology that can manifest results fast. Coconuts have the special ability to absorb karma. When they are smashed, the energy holding your progress back is forcefully disseminated. 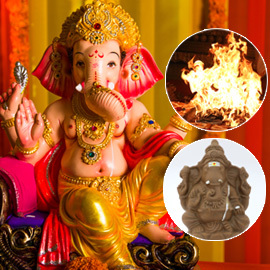 Book your individual Raja Ganapati Homa (Royalty Ganesha Fire Prayer) on Ganesha Birthday. Ganesha is the God of new beginnings. Ganesha is highly venerated by people across the world as the remover of obstacles, and it is imperative to invoke his blessings at the initiation of any new venture to ensure the success of the endeavor. 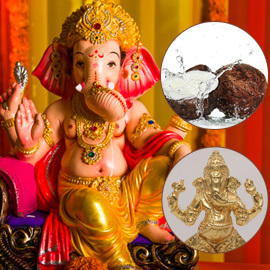 Performing Raja Ganapati Homa can bestow the Kingly blessings of Ganesha in terms of success, prosperity, leadership qualities, successful career and protection from all obstacles. You will be receiving the sacred grey ash powder from the homa and Vibhuti from the Pooja, which will be blessed in the Fire Prayers and Poojas. Keep this on your meditation altar and wear it on your forehead during meditation or at other times to expand the Divine blessings into your life. The ritual is the carbonization of thoughts. Carbon is our information bearing atoms. 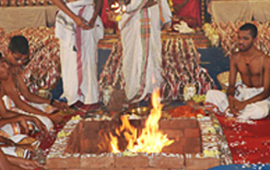 The carbon residue (ash) given out as Prasad is to be placed on the third eye area of the participants and carries the blessings of the archetypes invoked. The ritual is the carbonization of thoughts. Carbon is our information bearing atoms. 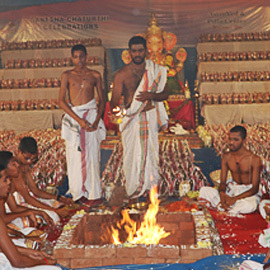 The carbon residue (ash) given out as Prasad is to be placed on the third eye area of the participants and carries the blessings of the archetypes invoked. 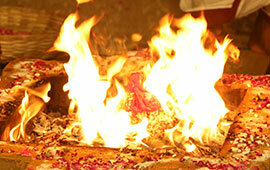 Book your individual Maha Ganapati Homa (Supreme Ganesha Fire Prayer) on Ganesha Birthday. Ganesha is the God of new beginnings. 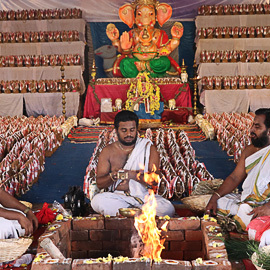 Performing Maha Ganapati Homa can bestow the can bless you with good health, longevity, happiness and success in all areas of life. 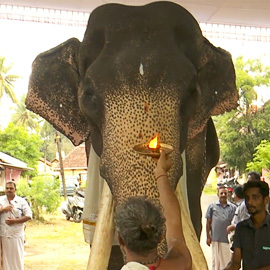 Gaja Pooja is to honor the elephant which personifies the divine traits of Lord Ganesha. The elephant is a symbol of respect, honor, magnanimity, and power. First, the elephant is bathed, then dressed, and decorated. 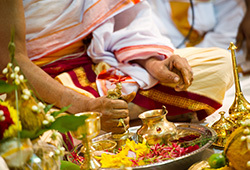 Then Vedic priests chant the mantras and performs Pooja by offering light, incense, flowers, and food. 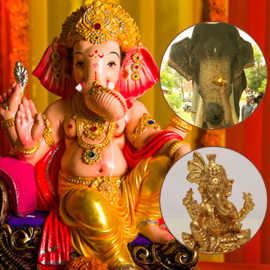 This invokes the blessings of Lord Ganesha, the elephant-headed God who removes all obstacles. You will be receiving the Vibhuti blessed in the Pooja. Keep this on your meditation altar and wear it on your forehead during meditation or at other times to expand the Divine blessings into your life. 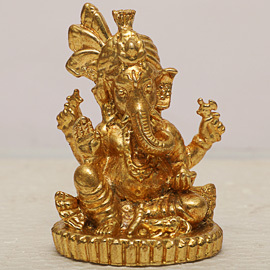 Order your 2.5-Inch Five Metal Raja Ganapati Statue which will be energized in Ganesha Birthday Fire Prayers and Poojas. 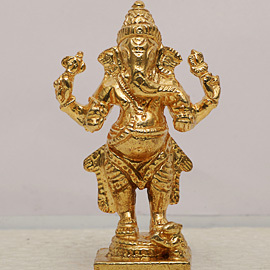 Order your 2.5-Inch Five Metal Maha Ganapati Statue which will be energized in Ganesha Birthday Fire Prayers and Poojas. You will be receiving the energized product, sacred grey ash powder from the homa and Vibhuti from the Pooja, which will be blessed in the Fire Prayers and Poojas. Keep this on your meditation altar and wear it on your forehead during meditation or at other times to expand the Divine blessings into your life. Please Note: Your energized product and prasad will be shipped from Chennai, Tamil Nadu, after the entire set of rituals are performed. For international shipping, please allow 2 – 4 weeks for delivery. You will be receiving the energized products sacred grey ash powder from the homa and Vibhuti from the Pooja, which will be blessed in the Fire Prayers and Poojas. Keep this on your meditation altar and wear it on your forehead during meditation or at other times to expand the Divine blessings into your life. Please Note: Your energized products and prasad will be shipped from Chennai, Tamil Nadu, after the entire set of rituals are performed. For international shipping, please allow 2 – 4 weeks for delivery. Participate in Ganesha Chaturthi, once-a-year event to venerate the supreme Lord Ganesha on his birthday. Invoke 42 blessings of Lord Ganesha on his birthday to remove karma, smash obstacles, fulfill your desires and other multifold blessings. You will be receiving the energized products and sacred grey ash powder from the homa and Vibhuti, which will be blessed in the Fire Prayers and Poojas. Keep this on your meditation altar and wear it on your forehead during meditation or at other times to expand the Divine blessings into your life.